My class on the History of Books and Libraries started off with a tour of ancient writing systems and libraries. We covered a wealth of fascinating content. For example, it had never occurred to me that the Lascaux cave paintings were three-dimensional, since they were painted onto irregular cave walls! I’d only ever seen flat-looking 2D pictures like the one at right. Today you can visit the Lascaux cave paintings in 3D through the magic of the Internet. Do it! I sat there enthralled as I floated through the twisty little passages and came away with an entirely different sense of this early artwork. “Early” is an understatement. 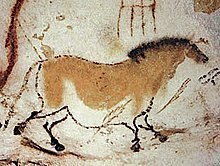 The paintings are estimated to be 17,000 years old! We discussed various writing systems, and you can browse several historical scripts as well as (quite curiously) constructed scripts, mainly for English, that replace our current alphabet. One of my favorites is Heptal (rendered at right). We also discussed boustrophedon, a word I will never again misspell. Finally, we covered the ancient libraries at Nippur, Ur, Nineveh, and Alexandria. The library at Nineveh was the creation of Ashurbanipal and grew to contain 30,000 clay tablets, with a complex indexing system and integrated book curses. My assignment for this week was to create a “learning activity” about Ashurbanipal and his library. Dare you take my quiz? Will you earn yourself Ashurbanipal’s admiration or his scorn?